We described the case of a woman with systemic lupus erythematosus (SLE) and nephritis who developed a transient bilateral knee synovial effusion during pulse therapy with a high dose of corticosteroids. A 62 year old woman was admitted to our division because of SLE with nephritis. Eight months before the admission, in April 2000, she developed arthritis in the last four toes of the left foot. She was treated with non-steroidal anti-inflammatory drugs, with complete remission. Serological findings showed a raised erythrocyte sedimentation rate (ESR) of 52 mm/1st h, normal C reactive protein, and a decrease in total protein and albumin. Three months later laboratory features showed an increase in ESR (62 mm/1st h), fibrinogen (4.4 g/l), proteinuria (5 g/24 h), and haematuria (>5 red blood cells (RBC)/high power field), with normal renal function and a decrease in total protein and albumin and the presence of antinuclear (ANA) and anti-Sm antibodies. Therefore she was admitted to our division where she had a kidney biopsy, which showed a mesangioproliferative glomerulonephritis (WHO class III). After four months of inadequate response to traditional treatment, she started monthly pulse corticosteroid therapy (1 g methylprednisolone for three days) before immunosuppressive drugs. At admission we did not observe any arthritis. On the evening of the second day of pulse steroid therapy, after a short walk, she complained of pain and flexion discomfort to both knees, which a physical examination showed were swollen. Thus, an arthrocentesis was performed with aspiration of synovial fluid (5 ml from the right and 6 ml from the left knee). 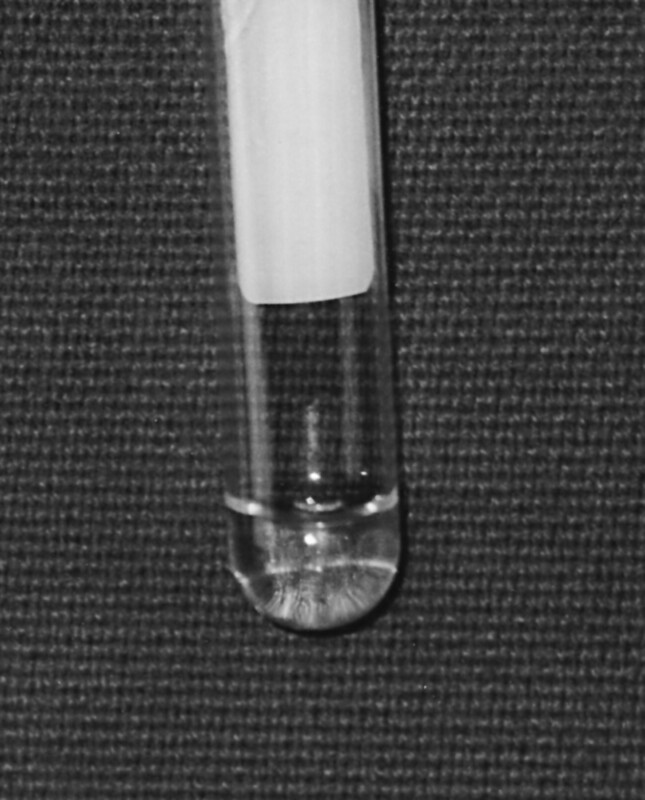 Synovial fluid analysis showed a colourless fluid, with high viscosity and excellent mucin clot formation (fig 1). A leucocyte count disclosed only 1 mononucleate cell/mm3 in the right knee synovial fluid and no cells in the left. No crystals were identified by light or compensated polarised microscopy. Inflammatory laboratory measurements carried out simultaneously were unchanged. Radiographs of the affected joints showed normal aspects. Effusion resolved with arthrocentesis and did not recur during admission to hospital. Synovial fluid analysis showing mucin clot formation. We agree with these authors that the small volume of synovial fluid, the low leucocyte counts, the rapidity of accumulation, and the transient nature of the effusion support a pathogenic mechanism related to fluid shifts across the synovial vasculature. Although glucocorticoids are known to exert a membrane stabilising effect, our patient’s fluid lost its own characteristics (colour, cells, chemical properties) and became similar to plasma as if it had been subjected to increased synovial capillary intravascular pressure. Synovial tissue permeability is markedly affected by increased vascular forces, which alter filtration pressure and synovial fluid production. Bertone et al showed, in an animal study, an increase in trans-synovial fluid flow associated with an increase in arterial and venous pressure.6 Raised arterial pressure, which is a side effect of high dose corticosteroid treatment, and low oncotic pressure due to a low protein plasma concentration in a nephrotic patient, can increase the trans-synovial fluid flow at a lower arterial pressure than normal. This rare side effect of high dose corticosteroid treatment should not be forgotten. Woods JE, Anderson CF, De Weerd JH, Johnson WJ, Donadio JV, Leary FJ, et al. High-dosage intravenously administered methylprednisolone in renal transplantation: a preliminary report. JAMA1973;223:896–9. Cathcart ES, Scheinberg MA, Idelson BA, Couser WG. Beneficial effects of methylprednisolone “pulse” therapy in diffuse proliferative lupus nephritis. Lancet1976;i:163–6. MacFarlane JD, Filo RS, Brandt KD. Joint effusion after kidney transplantation. Arthritis Rheum1979;22:164–9. Lally EV. High-dose corticosteroid therapy: association with non-inflammatory synovial effusion. Arthritis Rheum1983;26:1283–7. Bertone AL, Hardy J, Simmons EJ, Muir WW 3rd. Vascular and transsynovial forces of the isolated stationary equine joint. Am J Vet Res1998;59:495–503.